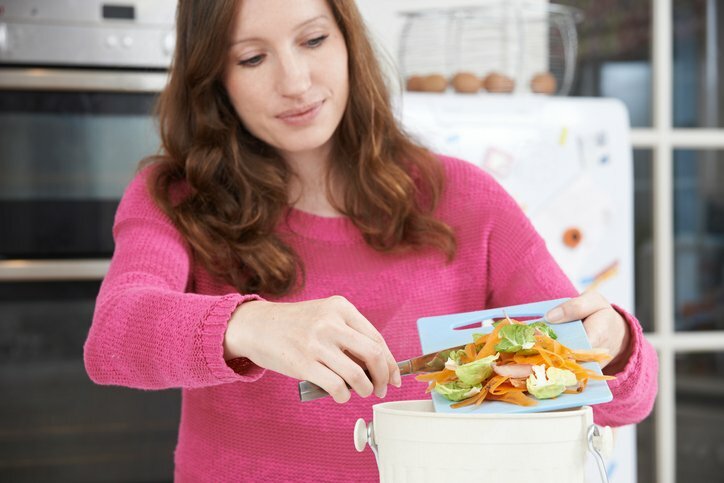 When deciding what to recycle and what must go to the landfill, you can’t help but start to wonder about the kitchen scraps If you’ve ever felt weird about dumping out vegetable stems and leftovers, you’re not alone. Our ancestors survived by figuring out how to make the most of every possible resource and why should we stop now just because we have plastic-lined landfills. With a long-term view, landfills aren’t actually a great answer in the first place because the most practical answer is to turn natural items into dirt and recycle things that won’t decompose into new stuff. While you may not have a recycling plant in your house, you don’t even need a patch of yard to start gardening with compost. You can compost kitchen scraps and yard clippings into nutrient-rich gardening soil with a pile in your backyard, or a barrel on any outdoor space you have access to. Large upright barrels will need to be stirred or you can compost into a medium sized barrel suspended on a rotating rack for easy stirring. For just your kitchen scraps, the smaller spinning barrel is a great convenience, though stirring a pile or large barrel is great upper body strength training. What you choose will depend on how much space you have to work with, how much you want to compost at once, and how much work you want to put into it. When building a compost pile or barrel, there are four aspects that you need to keep balanced in order to create the right environment for healthy decomposition into a soil you will want to use. These four aspects are Dry, Green, Soil, and Moisture. It’s important to keep an eye on your balance when deciding what and how to toss your kitchen scraps. While all four aspects are necessary, the thing to remember every day is to keep your dry and green compost about even. Too much moisture in a compost pile is bad for it. You can balance moisture and complex kitchen scraps with simple dry biodegradable materials like leaves, straw, sawdust, woodchips, and shredded paper. 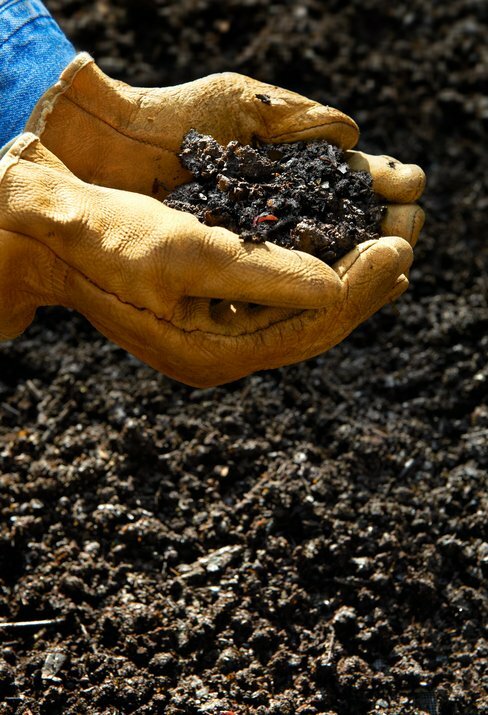 Green compost is usually what you’re trying to turn back into soil. Bits of vegetables and other natural items can be tossed into the pile or barrel and stirred whenever you get to it to start the decomposition process. The more finely chopped or broken up your green compost is, the faster it will break down. Healthy gardening soil has a supply of microorganisms that turn other organic material into gardening soil. If you don’t have any potting or rich healthy soil in your yard, you can ‘seed’ your compost pile with a sack of it bought from the gardening store. Until your compost has started producing its own soil, you’ll want to throw in a handful every now and then to re-up your microorganisms. For proper decomposition, compost needs to be kept damp but not sopping, just like good soil. If it is too dry, things will dry out instead of decomposing into dirt and if it’s too wet, your green ingredients will mold and rot unpleasantly instead. Keep your compost damp with a garden hose and drain or soak it up with more dry compost if it gets too wet. There has been a lot of debate as to the ‘best’ way to compost. If you do happen to be an ecologist, botanist, or very avid gardener, you can theoretically balance your mix to create the perfect soil for this purpose or that but most home composters are simply looking for a no-hassle way to turn kitchen scraps back into dirt without unnecessarily filling a landfill. The real questions come up when you’ve started composting and wonder just how many of your kitchen scraps you can safely compost. Are egg shells safe? What about meat bits, cardboard, or tea bags? Fruit and Vegetable Peels, Stems, and Leaves – Basically anything that grew as a plant can be safely returned to soil through compost. All fruits, vegetables, spices, and other plant-life from raw stems to cooked leftovers can go in the barrel. Cut Grass, Flowers, and Weeds – As long as you cut them up and add in balance with other ingredients, the clippings from your yard will turn happily back into dirt in your compost. Egg Shells – Birds naturally drop their hatched eggs on the ground to be crushed into soil so shells are prefectly safe. If you’re worried about residual egg protein attracting predators, rinse the shells first. Hair and Wool – While not exactly a kitchen scrap, your vacuum bag contents and floor sweepings, even full of hair, are safe to compost. Hair actually adds a reasonable amount of nitrogen to the mix. Cut-up wool can also be composted. Coffee Grounds and Tea Leaves – Coffee grounds and tea leaves are both organic and can be composted. The good news is that coffee filters and tea bags are also biodegradable so you can bundle it all straight from the pot to the compost barrel without having to dump out the grounds or leaves. Cardboard, Paper, Leaves, and Egg Cartons – Most houses create enough dry compost ingredients that you won’t need to buy sawdust or wood chips. Shredded paper, dry leaves, cut-up cardboard and those recycled egg cartons are all great for the purpose. Herbivore Bedding or Droppings – If you keep a herbivore from a hamster to a cow, their straw or wood-chip bedding and their inoffensive droppings are a natural part of the composting cycle. There are some things that shouldn’t be thrown into the compost pile even if they are bio-degradable or count as kitchen scraps like most other compostable things. Your primary concern should be predators, as any protein thrown in will attract them, but especially meat and animal parts. Composting is one of the best possible ways to keep your trash out of landfills and make sure everything even remotely organic gets a chance to turn back into good, healthy soil. Whether you use it for gardening or simply spread it around your flower beds to rejuvenate your local soil, you can get that warm fuzzy renewable feeling every time you toss a carrot stem or eggshell into the compost bucket.